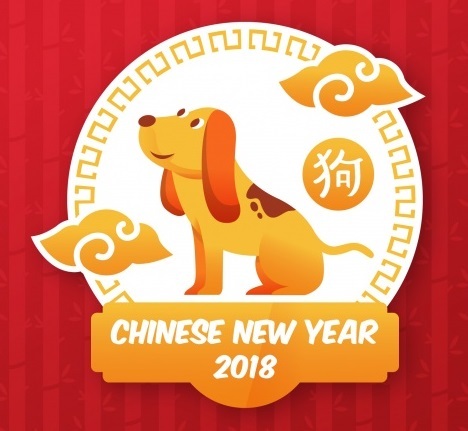 This Chinese New Year is the year of the Earth Dog! This year will have lots of action! It follows last year’s Fire Rooster (2017). The new year begins on Friday 16th February 2018. This year will be a good year overall however it could be an exhausting year for most. You will feel refreshed, regenerated and inspired but you will also feel pressure and stress in everyday work. In Chinese Medicine, the earth element involves the earth organs of the body which are the Spleen, Stomach and Pancreas. This is considered a good year overall for health but there are some health conditions exacerbated by the earth year, the most common will be digestive disorders. Overeating will be a problem along with reflux. Diabetes and pre-diabetes will be more common, and it will be harder to keep your blood sugar regulated. There will be an increase in diagnoses of cancer, particularly those involving the earth organs; the spleen, stomach, pancreas and lymphatic system. We all need to pay attention to our health this year. 2018 is the year to eat healthy, exercise and change our bad lifestyle and eating habits. Rat – This year will be fairly good and kind for you. During the new year, the Rat will have trouble feeling good in his own skin and his stress management will be put to the test in the first two months of the new year. However, the rest of the year should be smooth sailing. Ox – It may appear to be a good year for the Ox but do take some precautions. You may have past injuries that could be causing you more problems now. Try not to let your anxiety get the better of you. Make sure to stretch before exercising or else you may sustain some injury. You will need to make some adjustments to your exercise routine and diet this year. Overall, take care of your mental health above all else. Stress can cause a lot of other health problems if left untreated. Tiger – You can expect this year to be a very good year for you. Tigers must adopt a healthy lifestyle and radically change their eating habits. You may want to push yourself when it comes to exercise. But you need to make sure that you hold yourself back at times. If you work out too much, you will feel drained and tired. Find the right level of exercising and dieting to fit your personal needs. Try new things, but don’t do anything too risky. Make sure to exercise your mind, as well as your body. Rabbit – It is mediocre year for you. During the new year, stress is a real hassle for the rabbit, you should spend more time taking care of yourself and change your attitude. The start of the year might be a little rough when it comes to your health, especially if you are lazy. The best way to combat this is to get up and exercise in the morning. Being overweight can have many negative health impacts, so try to exercise more and change the diet. Dragon – This is not the best year for you, but your health will be excellent this year. Despite the busy schedule, the extra hours at work and the business trips, the Dragon will not forget to take care of his health. Stress is the only thing that can still affect you. Make sure to work on relieving your stress, or else it may cause you to become ill. Make sure to set aside some time for you to relax on your own as well. Taking care of your health is essential this year. Snake – This is a great year for the Snake. They will enjoy a good state of health in 2018. You are likely to be full of energy at the beginning of most days, but you will feel worn out by the end of the day. You are also likely to gain weight this year if you don’t watch your diet, so avoid sugar and exercise more. Horse – This is a great year for the Horse. You can risk facing health problems during 2018, due to the numerous responsibilities that you take on. Be careful of tension and stress. When it comes to your health, you will feel like your energy levels are a roller-coaster. At times, you will feel like you have the energy to do whatever you want. However, on the other hand, you will feel so tired that you can’t do anything. You will need to watch your diet closely. Eat fibre and other healthy foods to increase your metabolism. Goat – This is a great year for the Goat. You have the tendency of neglecting your own health, whilst taking care of the wellbeing of others. Remember to stay alert and quit any unhealthy habits. Focus on your emotional, physical and psychological needs. Monkey – It is a good year for Monkeys as hard work will be recognised. The Monkey feels the need to find inner peace in 2018. Activities like meditation, tai chi or yoga will help you relax and achieve physical strength. Being relaxed more often will also help to reduce your chances of becoming ill. You should try to work on your muscles too, and when it comes to your diet, work on cutting out more sugars – both of these things should boost your health. You are not likely to sustain any major injuries in this year. Rooster – If you need to make good decisions, make it now. Generally, quite a good year. Stress can damage the physical and mental health of the Rooster, if you don’t pay enough attention to it. Anxiety is also a risk for your health and the difficulties they encounter might manifest as exhaustion. Dog – This is your year, so do be careful in whatever you wish to do. You will enjoy good health, as long as you watch your eating habits and do not indulge in excessive eating. You need to get enough sleep every night if you want to keep the energy levels up as the year goes on. Make sure that you watch your diet this year, overeating is common for the dog in 2018. Try to reduce your stress levels this year as well. Pig – It is a year of fulfillment for you. In order to avoid any major health issues, the Pig needs to show caution. Focus on the positive aspects of life and try to avoid any negative thoughts. To stay in generally good health this year, keep up with some regular exercise routines and keep a close eye on your diet. A healthy diet is always beneficial for your long-term good health.